Our firm represented a gentleman who sustained life-threatening injuries after being struck by an SUV while standing next to his incapacitated truck on the side of Interstate 95 in Broward County, Florida. (See blog photo.) The accident happened in broad daylight during rush hour traffic. 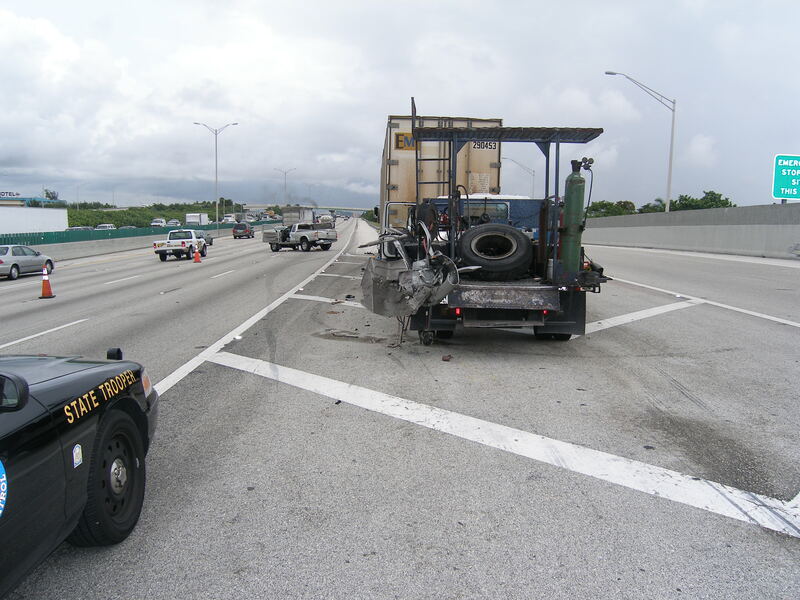 Following a tire blowout, our client had pulled his semi-tractor trailer rig into the highway gore, a paved section of roadway which separated northbound I-95 thru-lanes from two exit lanes, to await the arrival of roadside assistance summoned by his employer to replace the tire. The roadside assistance vehicle that arrived on the scene was owned and operated by an independent contractor. Essentially, it was a beat up old jalopy — see photo — that was not equipped with any warning lights of the type highway drivers have come to expect, and its small factory hazard lights were partly obscured by a rear metal door lowered to access the truck bed. It pulled up directly behind the trailer, blocking the trailer’s warning lights and hazard strips. As our client was standing next to the service technician, who was in the process of changing the tire on the left side of the trailer, both he and the technician were struck by a northbound vehicle whose driver had failed to timely recognize that the vehicles were stopped rather than moving with the regular flow of traffic. At the last split second this driver recognized the situation and swerved sharply to avoid striking the service vehicle. His vehicle clipped the left rear of the vehicle before striking the two gentlemen. His vehicle was totaled and each of the three individuals were transported to the hospital with severe injuries. By the time our firm was hired months after the subject crash, the driver of the vehicle had already passed away. He was elderly and we do not know if the accident contributed to his death in any way. His passing prevented us from obtaining his account of the events leading up to the crash. However, we did learn during formal discovery that a blood test performed at the hospital following the crash reported his blood alcohol level as being 296 milligrams per deciliter, more than three times the legal limit in Florida of 0.8. In a legal proceeding known as Summary Judgment, the defendant roadside assistance company tried to use this information to get itself removed from the case. It argued that the alcohol screening result demonstrated that its own negligence, if any, was not the proximate cause of the accident. This is known as the “intervening cause” defense. In other words, it was all the driver’s fault. Defendant’s Motion for Summary Judgment (see FRCP 1.510) was denied. I. I have personal knowledge of the facts stated herein. 2. I am a medical doctor licensed to practice medicine in Florida with training in General Psychiatry, Clinical Pathology and Forensic Toxicology, and am board certified by the National Board of Medical Examiners and American Board of Forensic Examiners. A copy of my curriculum vitae and blood alcohol testing qualifications are attached as exhibits to this affidavit. f. Deposition transcript of xxxxxx. 4. A review of these documents fails to reveal any reliable evidence to establish that xxxxxx was impaired, intoxicated or otherwise under the influence of alcohol or drugs at the time of the accident of xxxxxx. 5. For example, the traffic accident report completed by the Florida Highway Patrol specifically indicates that xxxxxx was not suspected of drinking alcohol or using drugs. Neither Oakland Park Fire Rescue nor North Broward Medical Center personnel were asked by the Florida Highway Patrol to draw blood for, or to perform, forensic toxicology testing. 6. In addition, the fire rescue report reflects that Oakland Park Fire Rescue personnel arrived at the scene and were attending to xxxxxx by 10:08 a.m. The fire rescue personnel observed that xxxxxx had suffered closed head trauma with a laceration to the right side of his head. xxxxxx could not remember the accident and his mental status was reported as confused, an expected sequela from head trauma. While the report reflects xxxxxx reported having consumed 3 beers that morning, there is nothing to indicate when or over what period of time beers were consumed. xxxxxx, EMT-P, who authored the report, testified in her deposition she could not say whether xxxxxx consumed any beers that morning or, if beers were consumed, whether they were consumed 9 hours earlier at 1 :00 am or more recently. Due to the lack of information regarding time of drinking, it is not possible to determine the BAC at the time of the accident. 7. The fire rescue report does not reflect that Oakland Park Fire Rescue personnel observed any signs or behavior indicating xxxxxx had been drinking alcohol and there is no mention that alcohol could be smelled. It is my professional experience that fire rescue personnel routinely record observations that suggest the consumption of alcohol if there is evidence of consumption. Ms. xxxxxx confirmed that her practice is consistent with my experience and testified she would have noted in her report if there had been an odor of alcohol or if xxxxxx exhibited signs of being intoxicated such as the slurring of words. 8. Ms. xxxxxx further testified that blood is not typically drawn from a patient unless the police request the blood draw and that in this case the Florida Highway Patrol did not request that blood be drawn from xxxxxx. This is a screening test result, and should be used only for medical (e.g. treatment) purposes. Unconfirmed screening results must not be used for non-medical purposes ( e.g. employment testing or legal testing). If indicated, a confirmatory alcohol (ethanol) level should be obtained by an approved methodology to provide a definitive answer. No evidence of a confirmation test by the current forensic standard test, gas chromatography FID, was found in the orders, results, or any other section of the medical records, or any other record in this case. 11. None of the potential errors listed above were eliminated by testing and thus each of these errors could have had a dramatic effect on the measurement obtained by the laboratory at Broward Health North. 12. In addition, the Abbott analyzer used by the laboratory at Broward Health North uses an analysis that measures two reactions, in other words, an indirect testing of the indirect testing, which further compounds the potential for errors in the measurement of blood alcohol levels. 13. While the Broward Health North toxicology report for xxxxxx reflects that ethanol was measured at 296 milligrams per deciliter (mg/dl), due to the potential errors outlined above and other potential errors, this measurement is not forensically reliable. In fact, due to the lack of complete chain of custody, there is no forensic proof that the serum ethanol test results are from the blood sample collected from xxxxxx, thus the entire result may be incorrect. 14. Even if xxxxxx had a blood alcohol level above the legal limit at the time of the subject accident, a conclusion that cannot be made here, it is possible that xxxxxx was not impaired and that his blood alcohol level did not affect his driving or cause the subject accident. In my experience, alcohol dependent people develop a tolerance to alcohol and I am aware of cases where individuals had a blood alcohol level above the legal limit, even greater than the level reported in the Broward Health North report, and function without observable impairment despite the elevated level of alcohol. 15. The evidence in this case as reported by those individuals at the scene does not suggest xxxxxx was exhibiting signs of impairment immediately following the collision. SWORN TO AND SUBSCRIBED that the foregoing instrument was acknowledged before me this xxxx day of xxxx by Stefan Rose, M.D. who is personally known ___ or who has produced identification ___ .